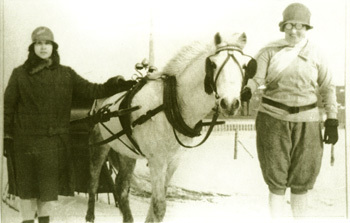 Newfoundland Pony, early 1900s, harnessed for a mid-winter outing. The Newfoundland Pony has evolved from several types of working ponies brought to Newfoundland in the 1600s by the first settlers from the British Isles. The Exmoor, Dartmoor, New Forest, Galloway, Welsh, Connemara and Highland ponies that arrived in Newfoundland interbred over three centuries in near complete isolation. 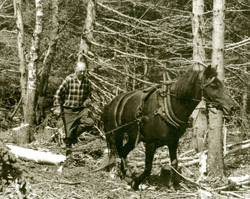 The pony that emerged was perfectly adapted to the harsh Newfoundland environment and the hard work involved in hauling firewood, timber, kelp and rocks, working the rocky soil and transporting the inhabitants from place to place. It’s long thick coat and ability to survive outdoors through the Newfoundland winters made the pony an asset economically. However, the greatest attributes of the Newfoundand Pony are its quiet temperament and gentle disposition. As a result of its role in the social and economic fabric of communities throughout the Island, the Newfoundland Pony is an integral part of the Island’s culture and heritage. Traditionally, the ponies roamed free in large community herds during the summer months. It was common practice to turn loose cattle, oxen, goats, sheep and ponies to graze on community pastures. Fences were erected to keep animals out, not in! In the fall of the year, community members would collect their livestock and return them to their own properties. 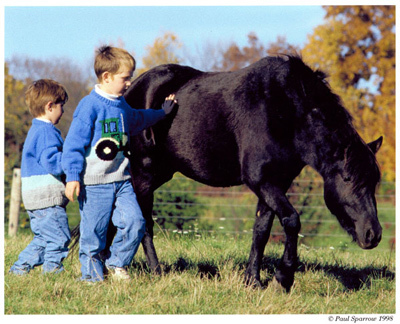 Newfoundland Ponies have been part of our family as far back as anyone can recall. 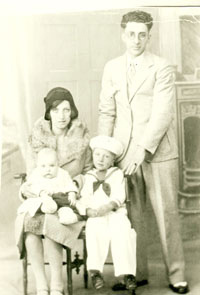 Grandmother Vera COMBDEN of Daniel’s Harbour, Newfoundland recalls purchasing a Newfoundland Pony gelding named “Garland” for $12.00 in 1931. In the winter, Garland was used for hauling wood from the forest to the sawmill and to stoke the kitchen’s woodstove fire. During the summer months, Garland would be enticed away from the community herd with a piece of home-baked bread dipped in molasses. Once caught, he was used to haul dump carts and cultivate gardens. Visiting family in Newfoundland in 1995, we looked in vain for any trace of the large herds of ponies that had dotted the Island communities. When we learned of the demise of the majority of these beautiful animals, and the need for breeders to prevent their complete extinction, we made a commitment to join the efforts to protect and promote their survival. 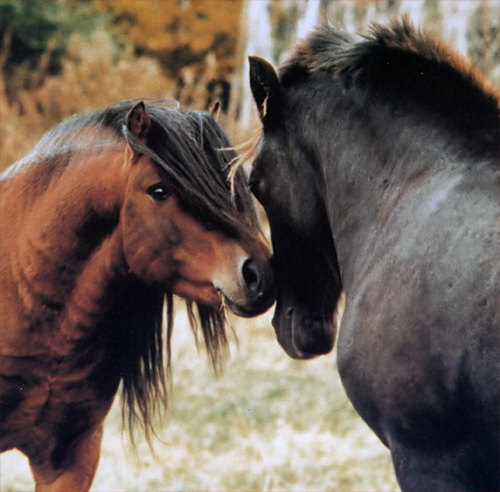 In 1994, Newfoundland pony stallions were so few in number that a search was launched to comb the Island in the hope of turning up breeding stock. Eight stallions were found. 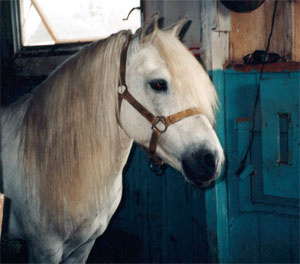 Deerfield Farm’s stallions are first generation descendants of three of these “found” bloodlines: Rusty of the Black River; Skipper of Avalon; and Prince Tamarack. 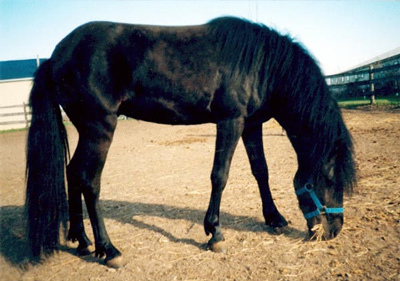 Of the 300 or so ponies that remain, many are geldings and aged mares. 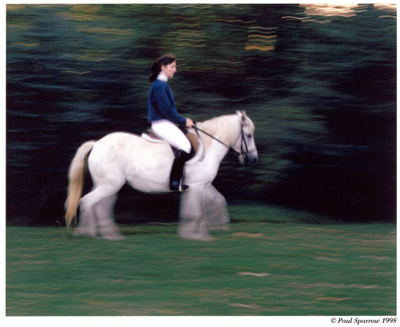 The number of ponies able to carry on the breed is still relatively small. The Newfoundland Government has recognized the pony as a Heritage Animal and ponies can only leave the Island with the issuance of a government permit assuring that they are going to reputable breeders. Newfoundland Pony Society acts as official registrar for the breed. As is the case with any heritage livestock breed, their long-term viability is difficult to guarantee if they do not serve a useful purpose. Breeding to maintain an animal as living museum piece or as a testimony to times gone by has proven not to be a tenable proposition. Thankfully, the Newfoundland Pony does remain a viable breed. This versatile pony can be used for a number of different purposes. Because of it size and disposition it is an excellent mount for children and small adults. Many of its number excel as driving ponies. Further, this pony is renowned for its strength, stamina and willingness to pull hard in the collar and as such, it is a hardy draft pony.